Get on Board with A City Committee! A great way to participate in the civic affairs of our community is by participating on one of the City of Kingston's committees and boards. Several of these bodies are seeking informed advice from committed citizens. I sit on several municipal boards and enjoy the perspectives, information and thoughtful advice that volunteer citizens contribute. Apply by Oct. 30 at 4:30 p.m. online at www.CityofKingston.ca/committees or at the city clerk's office at City Hall, 216 Ontario St.
A total of 33 positions are available. 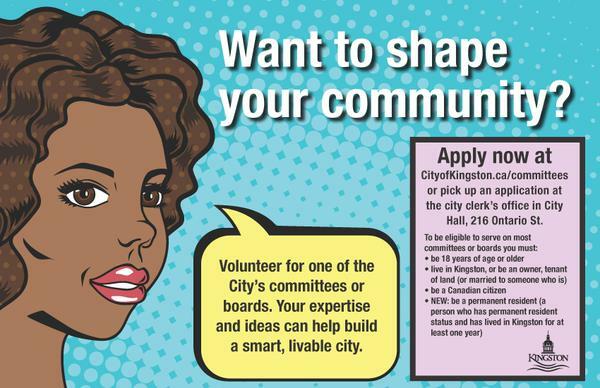 Council passed a resolution earlier this year to help support more diversity on our boards, so newcomers with permanent resident status and who have lived in Kingston for at least a year are welcome to apply to volunteer on a committee. Applicants must also be 18 years or older and live or own property in Kingston. Wednesday, Oct. 21 in Room B at the INVISTA Centre, 1350 Gardiners Rd. Wednesday, Oct. 28 in the family room at Rideaucrest Home, 175 Rideau St. Thank you! An email will be sent to you shortly, please follow the instructions to confirm your subscription.